What a great dress! Love the cutting! The Green Lantern was a Muslim woman? mashaallah! what a stunning dress! MashaAllah... beautiful! Is she Bahraini? oh my! she's like a modest mermaid! ;+) beautiful. What can I say? She looks chic! Appears to be a combination of many cultural garbs, which is interesting-in a nice way. Beautiful Moroccan dress mashallah! You go girl! :D i love the color scheme. WOWWWWWWWWWWWWW Stunning masha'Allah what a beautiful sister and loving the bright colours of the outfit. Oh my worddd! !what an abosolutely gorgeous dress! love love love it. have we seen this lady on here before? AMAZING mashaAllah! I would love to know where to get something similar myself. 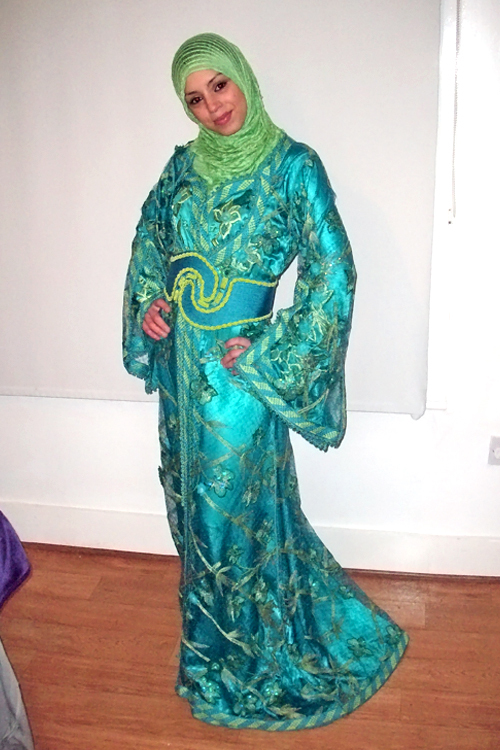 Stunning colour and rich fabric - a pretty sister, mashallah! She looks so gorgeous with that outfit. i like the color too. My fav.